Grade 3 Activity about Martin Luther King, Jr.
← Third graders working collaboratively to solve word problems involving area using two column notes. 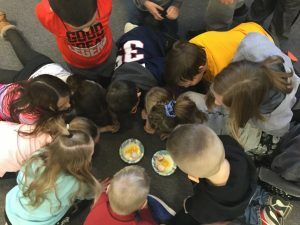 Yesterday 3rd graders compared white eggs and brown eggs. They discovered that the shell color doesn’t matter, both are eggs can be used equally to create the delicious foods we enjoy. Students were able to connect this illustration to our learning about Martin Luther King Jr.’s contribution to our American culture. We should not be segregated by our skin color, we are all equally human.